1. In a large nonstick saucepan, heat oil over medium-high heat, add to the lamb cubes. Cook for 5 minutes or until well-browned on all size. Remove lamb from the saucepan. 2. In the same saucepan, heat more oil over medium heat; add garlic, mushrooms, leeks, carrots, green peppers, onion and zucchini. Cook for 8-10 minutes or until softened and browned stirring occasionally. Stir in tomato paste and wine/juice. 3. Return lamb to saucepan along with tomatoes, beef stock, rosemary and bay leaf. 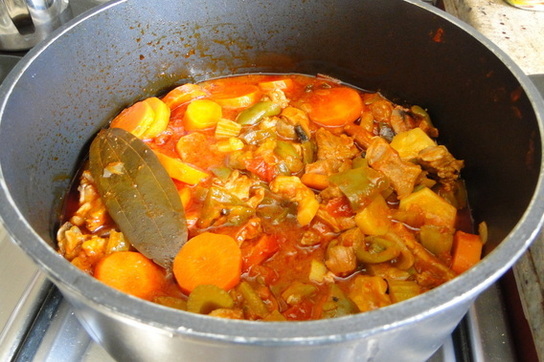 Bring to a boil, cover; reduce heat to medium-low and simmer until meat and vegetable are tender. 4. Meanwhile put potatoes in a saucepan with water to cover; bring to boil and cook for 15 minutes or until tender when pierced with the tip of a knife. In a non-stick pan melt the butter or margarine over medium heat; add garlic and onion and cook for 4 minutes or until softened. Drain cooked potatoes and mash with chicken stock and sour cream. Stir in onion mixture on large serving platter and pour stew over the top. 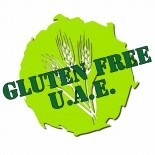 This entry was posted on 06/01/2012 by glutenfreeuae in Cooking, Recipes and tagged gluten free, glutenfree, lamb, stew.